Difficulty Breathing: This is may be the most serious of all non-trauma-induced injuries, because hypoxia (low oxygen levels) and the events that follow can lead to respiratory arrest and possibly death if not treated quickly. Difficulty breathing is an immediate emergency. It may arise slowly or acutely. Regardless, when you notice any of these symptoms, your dog is in trouble and needs veterinary care. Symptoms include labored breathing, blue or purplish gums or tongue, excessive panting, exercise intolerance, etc. If you see or suspect these symptoms, seek immediate emergency veterinary care. Restlessness: Simply put, restlessness is when your dog simply cannot get comfortable. Restlessness can be a sign of many urgent or emergency situations. It can include excessive panting, inability to lie down comfortably, abdominal distension, or unsuccessful attempts to vomit. Restlessness can also be a primary sign of GDV, which is a life-threatening condition requiring immediate care. Gastric Dilatation and Volvulus (also referred to as "bloat") is one of the most urgent and life-threatening situations a dog can face. It is generally seen in deep chested large breed dogs such as German Shepherds, Great Danes and Standard Poodles, but can occur in any breed. Some dogs will exhibit all of these symptoms, but others may only pant and act restless. It is essential for your dog to receive emergency care if you witness any of these symptoms. Seizures: All pets with a first-time seizure should be evaluated by a veterinarian. Seizures often come in clusters and can become progressive. Seizures have many potential causes including toxin exposure, head trauma, epilepsy, brain tumor, etc. If your dog has never had a seizure and is not currently under the care of a veterinarian for a seizure disorder, we recommend seeking immediate medical attention. Collapse or Profound Weakness: These can be symptoms of a major illness like internal bleeding, anaphylactic shock, certain poisons, and some types or organ failure. No matter the cause, seek emergency care immediately if your dog collapses or seems to be uncharacteristically weak. Major Trauma: It is essential to seek immediate medical attention if you have reason to suspect hemorrhaging, or if your dog has fallen, been struck by a car, or gets into an dogfight. Remember, some dogs hide their injuries as an instinctual defense mechanism, so if something has happened that would cause you to suspect major trauma, seek immediate medical attention. Dog Fight: All dogs should be seen by a veterinarian after a dog fight. The bite wounds or puncture wounds on the outside of a dog are usually just the tip of the iceberg when it comes to the amount of damage the dog may have sustained during the fight. This is especially important when a small dog has been attacked by a larger dog. A puncture wound on the skin may not seem severe, but can hide extensive underlying damage to your pet's abdominal or thoracic organs that should be evaluated by a veterinarian. Protracted Vomiting or Diarrhea: If your dog vomits once or has a single loose bowel movement, he or she may not require any treatment other than a few hours of resting the stomach and a day or two of bland food. However, repeated vomiting and diarrhea can rapidly lead to life-threatening dehydration. This can also be a symptom of major problems such as gastrointestinal obstruction, parvovirus, or other condition that requires veterinary care. Struggling to Urinate: Any pet struggling to urinate should be evaluated immediately by a veterinarian. Causes for difficulty urinating can range from a lower urinary tract infection to life-threatening urinary obstruction. Because of this, if you do notice that your dog is struggling to urinate, seek immediate veterinary care. Not Eating or Drinking: This is a judgment call on your part. Your dog will not finish every bit of kibble in his or her bowl every time. However, if he or she goes for an extended period of time, like 24 hours or more without eating or drinking, or if the not eating or drinking is accompanied by other symptoms, such as lethargy, vomiting, or diarrhea, we recommend having your pet evaluated by a veterinarian. Coughing: Excessive and repeated coughing can be due to a variety of underlying causes. When in doubt, the safest course of action is a veterinary visit. Loss of Use of Rear Legs: This is especially common in Dachshunds, Corgis and other breeds with short legs and long backs. It can be a sign of injury to the spinal cord. This paralysis or partial paralysis is usually very painful, and rapid treatment can make a big difference in outcome. This is an emergency situation and you should seek immediate care for it. Severe Pain: This is always an emergency. If your dog is restless, hiding, vocalizing, panting, profoundly limping, or exhibiting other symptoms of severe pain, seek immediate veterinary care. Known Exposure to Toxins: We discuss this more in depth in its own section on this page, but if you know or suspect your dog has ingested toxins or medications, contact the ASPCA Poison Control Hotline, or seek immediate care at a veterinary hospital. If possible, bring all packaging that came with the substance your pet was exposed to. Because emergencies can happen anytime day or night, it is extremely important to find a 24 hour dog hospital in your area before you need one at a moment's notice. For our patients, as well as any canine requiring emergency dog care in the Richmond area, Advanced Animal Care is proud to offer a 24 hour veterinary hospital with an emergency dog hospital. If you do not live in Richmond, then we urge you to seek out and familiarize yourself with the 24 hour dog hospital in your area. This way, should an emergency arise for your beloved canine companion, you will be prepared to get him or her to an emergency dog clinic immediately instead of wasting valuable time that could result in the worsening of an already tragic situation. Apply a muzzle to your dog's mouth as long as they are not having difficulty breathing, this will prevent you from being bitten by your distressed pet. It is a good idea to purchase a muzzle ahead of time and acclimate your pet to wearing a muzzle before it is needed. If your dog shows aggression, you may need someone to aid you in securing and transporting your dog. Towels may be used around the head or neck to attempt to keep the dog from biting while you move it if you are unable to muzzle your pet. For external bleeding due to trauma, apply direct pressure to the wound with a clean, dry cloth if your pet will permit. Keep your pet as calm as possible during the drive to the nearest emergency veterinary hospital. Do not attempt to apply any type of tourniquet as doing so frequently results in more harm than good. Do not give your pet any human medications without being expressly instructed to do so by a veterinarian. Many human medications are not safe for pets and can cause serious side effects. Because cardiac arrest in pets occurs for very different reasons than humans, CPR for pets is typically not succesful, even in a fully equipped emergency hospital. Attempting to perform CPR at home can result in broken ribs and lung brusing/hemorrhage, and frequently results in more harm than good. 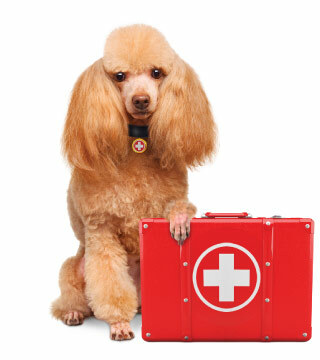 If you feel your pet needs CPR, we recommend getting your pet to the nearest emergency hospital as soon as possible. If you suspect your dog has been exposed to a toxic substance, it is important to seek emergency veterinary care immediately. Bring the bottle and all packaging that came with the product your pet ingested. Call on your way to the hospital and tell them what the dog ingested and how long ago it was ingested and the amount. Proudly serving the Richmond metropolitan area since 2009, Advanced Animal Care is open 24 hours a day, 7 days a week, 365 days a year for any dog emergency that occurs. If you feel your pet is experencing an emergency, simply call our hospital at (859) 202-3641, and our staff will be glad to advise you on the next best steps for your pet.